NOTE: These worlds have been compressed using GZIP. If your VRML browser can not handle compressed files, Click "HERE" to access our un-compressed worlds. Click "HERE" to access more worlds. VRML stands for "Virtual Reality Modeling Language" and is a specification for defining three-dimensional environments on the World Wide Web. 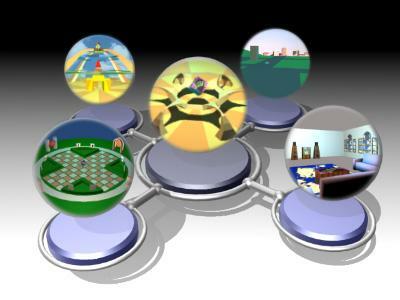 Using VRML tools such as Pioneer, Web "surfers" can navigate through 3D worlds, create their own 3D objects or edit existing ones and link them to other media types on the Web such as HTML, sound and video. Caligari was founded in 1986 with the mission to operate and develop tools for on-line 3D worlds where people can learn, play and work. We announced our support for VRML at VR World on May 22, 1995, and we made Caligari Pioneer, our first VRML product available to the public on October 12, 1995. On July 18, Microsoft announced that it is licensing a custom version of Pioneer for inclusion in Blackbird, Microsoft's end-to-end media creation tool due in early 1996. How does VRML compare with HTML? Where can I learn more about VRML? Caligari Pioneer is the world's first VRML tool that lets anyone browse and build three-dimensional home worlds on the World Wide Web (and soon on the Microsoft Network). Caligari Pioneer is unique because it seamlessly integrates 3D modeling with complete VRML browsing and authoring. First of all, Pioneer is a full-featured VRML browser. It supports not only textures and inlining, but also levels of detail ( LOD). Unlike many other VRML browsers, it does not need to rely on HTML browsers such as Netscape to fetch VRML scenes. Caligari Pioneer comes with built-in networking support and only need to communicate with HTML browsers when you are trying to access an HTML document. We have gone to great lengths to make navigation through VRML scenes as easy as possible with Pioneer. If you already know how to play games like DOOM, you should be up and flying in no time at all! Since we use Intel's 3DR for rendering acceleration, Pioneer is already set up to take advantage of a new breed of 3D acceleration chips. In fact, the version you download already includes the latest 3DR drivers for the Matrox MGA Millennium graphics acceleration card. Caligari Pioneer is the only VRML browser that also includes 3D creation tools and VRML authoring. While most VRML authoring tools only allow you to import models, arrange them and add some hyperlinks, Caligari Pioneer allows you to create objects with levels of details and to inline objects, textures or levels of detail. It can import 3D objects not only from trueSpace, AutoCAD, 3D Studio, Wavefront, Imagine and LightWave formats, but it can read in VRML files as well! Since many of you who are just getting started in 3D have existing 2D assets, we made sure that Pioneer can import your 2D illustrations files via a PostScript interpreter and images via BMP and JPEG. Caligari Pioneer lets you assign material attributes not only for entire objets, but also on a per-face basis. It also includes vertex painting tools, which allow you to create multi-color gradients across surfaces. You can choose between infinite and local light sources. When arranging 3D shapes, you work with fully-colored textured objects that accurately reflect "virtual" light. We also built in many options for reducing the size of your VRML files. Caligari Pioneer automatically strips out unneeded normals, and it allows you to reduce file size by deleting white spaces out of VRML ASCII files, collapsing hierarchies and reducing the number of digits that get stored for each 3D coordinate. Since Pioneer includes VRML browsing and imports VRML files, you can use the Web as your 3D clipart library. Another advantage of the built-in browser is that you don't have to guess how your creations will look in a browser. No more switching between your browser and your authoring application! You can test out if your links work, inlines load as intended and navigation through your scene is comfortable simply by switching from build to browse mode inside of Pioneer. Even better, Caligari Pioneer is the only VRML authoring package that comes with built-in 3D creation tools. Caligari Pioneer includes many of the modeling features that have made trueSpace the most popular and most highly-rated 3D graphics package. While most modelers still force you to work in wireframe mode, Pioneer allows you to manipulate texture-mapped objects in real time. In Pioneer, you can draw 2D polygons and transform them into 3D objects through lathing, tips and extrusions. You can also use parametrized 3D primitives and TrueType fonts. Editing is object-oriented and can even be done on face level. All tool work in perspective space and with real-time feedback, but it is also possible to bring up a control view from any camera in the scene. Step 1: Select the "Preferences..." item in the "Options" menu. Step 2: Select the "Helper Apps" tab. Step 3: Click the "Create New Type. . ." button. specify where Pioneer is on your hard drive. Step 7: Select the "Save Options" item in the "Options" menu. Step 1: Select the "Helpers..." item in the "Edit" menu. Step 2: Click on "Add.". Step 3: Enter VRML World into the "Description" field. Step 6: Choose Text under the "Encoding" options. it as your helper application to display VRML files. The World Wide Web is based on networking protocols such as HTTP and on a number of formats that describe how text, images, sound and video are represented across the different types of computers that are connected to the Internet. The most important format today is HTML, which allows text and graphics to be displayed together using a two-dimensional page metaphor. The latest trend among HTML browsers such as Netscape Navigator is to include HTML authoring capabilities as well because many people who initially were content to just browse the Web are becoming interested in publishing their own home page. VRML is to 3D what HTML is to 2D. While HTML specifies how two-dimensional documents are represented, VRML is a format that describes how three-dimensional environments can be explored and created on the World Wide Web. Since 2D is really just a subset of 3D, any two-dimensional object can be easily represented in a three-dimensional environment. In Mark Pesce's book "VRML: Browsing and Building in Cyberspace" Tim Berners-Lee, the "father" of the Web, reasons that VRML is the future of the Web because it is more natural for us to be immersed in a three-dimensional space than to click our way through hyperlinked pages. Using VRML, you can not only add sizzle to your site, but leverage the fact that each of your visitors has spent their entire life navigating in three dimensions. We make sense of the world by quickly analyzing factors such as the speed of approaching objects (e.g. a car), the location of light sources and the texture of surfaces. Since many of these processes happen subconsciously, a clever designer can guide visitors through spaces and towards the focus of attention without forcing her to make explicit choices. Just like in the real world, the visitor maintains a first-person perspective and completely controls how close to move towards an object and from what perspective to view it. VRML doesn't really do anything. It is simply a scene description language that standardizes how three-dimensional environments are represented on the Web. Unlike programming languages such as "C++", VRML does not have to be compiled and run. Rather, VRML files get parsed and then displayed. Since this is a much faster process, the creation of VRML files is much simpler than programming. It also allows for more interactivity and facilitates incremental improvements. Here is how VRML works from the user's perspective. First, you have to obtain a tool that "speaks" VRML. There are freely downloadable versions of products such as Caligari Pioneer, Intervista WorldView, Paper Software's WebFX and TGS WebSpace. Some allow you just to browse in 3D, while others allow for various levels of 3D creation and VRML authoring. Since most people browse before they build, we'll focus on browsing here and discuss the creation of VRML worlds later on. After you have installed and configured your VRML application, you can load a VRML file the same way you access an HTML file: either by clicking on a link or typing a URL and hitting return. If you typed the URL into your VRML application, then the file will be loaded. Based on the speed of your connection and the size of the file, the loading time can be as little as a few seconds or as much as a couple of minutes. Well-structured VRML files will allow your VRML browser to load the file in pieces, which has the advantage that you can start exploring right away while the browser fetches more detailed objects and those that are not currently in your view. As you navigate through the scene, you will notice that some objects are linked. If you click on them, you will jump either to another VRML world or to another media type such as HTML. While this gets you to other places quickly, it leads to the same problem as "jumping" from link to link in HTML: you jump from a document on one topic on a server in one place to another document on a different topic in a completely different place. This is what Mark Pesce, co-creator of VRML, calls "there being no there there." When we walk through a town, we look around and build a mental map of the place. If someone tells us that we have to turn right at the next intersection, we can visualize this and get to where we want to go. There is a sense of continuity, and we can see how quickly we progress towards our goal. Sometimes we get lost, but this is part of our experience(and often that is how we discover new places or meet new people. Typing a URL and watching the byte counter as the destination loads onto our screen just isn't the same. While experts have no trouble with this (hey, they can use the Internet just by typing UNIX commands), the majority of people will only get on-line if it works like the real world. Abstract URLs are difficult to remember, and jumping from one text fragment to another is not something that people encounter on a daily basis. However, once the Web allows us to use our spatial perception and conforms to the way we work (rather than forcing us to adopt the way computers work), the Web will become just another place we go to accomplish our chores, chat with friends or learn new skills. VRML allows for much richer interaction than HTML. When viewing two-dimensional home pages, your options are basically limited to jumping from page to page and looking at images from a fixed, pre-determined perspective. When visiting VRML worlds, however, you can freely choose the perspective from which to view the world. In addition, you can navigate unencumbered through 3D environments, the contents of which are only limited by the imaginations of their creator. VRML spaces are inexpensive to build, can be bigger than the earth, and the objects in it can (and often do) defy the laws of gravity. As you walk or fly through such a world, you can pick up objects and inspect them from all sides, and if your VRML application includes authoring capabilities, you can even create and modify 3D objects. Don't like the color of your house? Just re-paint it with a few clicks of the mouse! Thus, VRML allows 2D home pages to expand into 3D home worlds. Traditional commercial Web sites can draw in new users by adding three-dimensional environments that are fun to explore and by providing a natural way to navigate through the information available on the site. Ultimately, you will be able to collaborate with other users in context-rich 3D environments rather than typing away at the command prompt in a text-based chat room. The best place on the Web is probably https://sdsc.edu/vrml/. If you are ready for a technical discussion of VRML, you should join Brian and Mark's list. Just send an e-mail to [email protected] with 'subscribe www-vrml ' as the body of the message. By creating several levels of detail (LODs) of an object and grouping the individual LOD children into an LOD group object, complex 3D objects are represented at lower resolutions when they are far away from you. As you move closer towards LOD objects, they will reveal additional detail on the fly. By creating several levels of detail for each object, you can create complex scenes, but still maintain decent frame rates because the LOD technique keeps down the number of polygons that have to be rendered in real time. Through inlining you can break up large VRML scenes into lots of little files that can be loaded incrementally. A VRML file, which is what you create when you save a scene in Pioneer, contains a number of entities called nodes. One of the most powerful nodes is called WWWInline. When you specify an object as Inlined, then save the scene, the inlined object is saved in a separate file anywhere you specify, and the main scene then contains only a reference to that file. Then, when that file is loaded, Pioneer sees the reference, goes out to where the Inline object file is, and loads that too. The powerful aspect is that the Inline object can be anywhere on the World Wide Web! Thus you can build 3D worlds that contain objects from many different sites, not just ones you've created. When you first launch Pioneer, you will be placed in Walk Mode, which works like the navigation controls for many popular action games. As you move the mouse forward and back (away from you and close) while keeping the left mouse button pressed, you will move forward and backward in the scene. As you move the mouse to the left and right while keeping the left mouse button pressed, you will turn to the left and right. If you keep the right instead of the left mouse button pressed while moving the mouse to the left and right, you will move to the left and right while continuing to look straight ahead. If you keep the right mouse button pressed while moving the mouse forward and back, you will move up and down while continuing to look straight ahead. Finally, if you keep both mouse buttons pressed while moving the mouse forward and back, your view will tilt down and up. If you would prefer to tilt up as you move the mouse away from you, you can check "PitchSwap" under "Preferences" in the File menu. Once you feel comfortable with the Walk Mode, you can also try the Fly Mode. The directions of your mouse movements generally have the same effect as in Walk Mode, but once you are moving, you no longer need to move the mouse to keep going in the direction you were headed. The only exception is when you tilt your view up and down. Since it is easy to get disoriented when tilting too much, you will need to continue moving the mouse while keeping both mouse buttons pressed.